We are delighted to have been successfully assessed to the ISO 9001 standard by the relevant independent awarding body. We have been awarded ISO 9001 Certification because we have established an internal Quality Management System which ensures our customers receive products or services that are fit for purpose and meet and hopefully exceed their expectations. ISO 9001 is often seen as the bedrock upon which all the other ISO standards are built as it originates from the need for consistency in service that we all want, need and expect. We are delighted to have been successfully assessed to the ISO 14001 standard by the relevant independent awarding body. 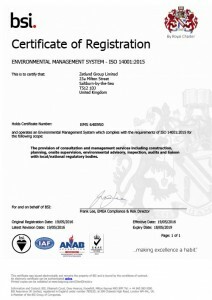 ISO 14001:2015 specifies the requirements for an environmental management system that we use to enhance our environmental performance. The standard helps us to manage our environmental responsibilities in a systematic manner that contributes to the environmental pillar of sustainability. Consistent with our environmental policy, we aim to enhance our environmental performance, fulfil our compliance obligations and achieve our environmental objectives. We are delighted to have been successfully assessed to the OHSAS 18001 standard by the relevant independent awarding body. BS OHSAS 18001 is a framework for our occupational health and safety management system. We have demonstrated that we have the policies, procedures and controls needed for our organisation to achieve the best possible working conditions and workplace health and safety – all aligned to internationally recognised best practice.